(L) Jim Downey There is a certain buzz these days as insiders talk about a new hard white spring wheat from Western Canada. The product, designated as HW024 until an official name is released, is the third hard white wheat to date coming out of the Agriculture and Agri-Food Canada Cereal Research Centre in Winnipeg. 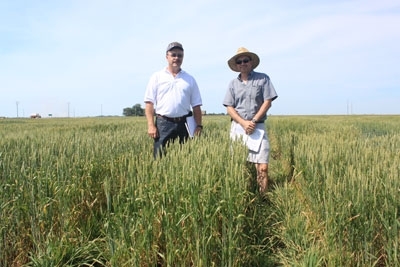 Breeder Dr. Gavin Humphreys developed HW024 and is in charge of the hard white wheat program. “This is front and centre for SeCan right now. We’re looking at spending quite a bit of money to speed up the seed multiplication so we can advance the commercial introduction by one year,” Downey says. Bread quality Sample results of the early material, tested at the Canadian Grain Commission (CGC), probably started the buzz. The new wheat produces nice white flour, and it appears that millers will be able to extract up to two percent more flour per tonne. “Millers look at that as money in the pocket. If they get one or two percent more flour, that’s great. It could be very popular,” Downey says. The gluten in the flour also is very strong. It will need to be monitored, but it opens the opportunity for blending with other wheat flour that has less gluten strength. Slightly higher protein in this flour is a third benefit. This gives HW024 an increased ability to absorb water. Increasing water content is a “cheap” way to make more money if the bread quality is not reduced. Commercial seed for the new variety can be anticipated for use in the 2013 crop season, according to Graham Worden, Canadian Wheat Board senior manager in technical services. The new wheat, at this point, is likely to be attractive to both growers and premium markets. “Asian countries typically pay a little more for that higher quality wheat,” Worden says. The first commercial acres in 2013 and 2014 probably will be contracted through Identity Preserved (IP) programs, he says. The IP approach enables the contractor to know how much is grown and where it is. With that knowledge, quality evaluations for customers also can be more efficient. “Ultimately, for this hard white wheat class, we’re looking for many varieties that will provide a wide range of adaptability throughout the Prairies. Then farmers will have a choice on what to grow. It will take time to build a pool of available varieties in this class, but this is a significant step. We’ve got high hopes for it,” Worden says. The vision is to produce a white wheat that does not require bleaching. If colour is not an issue, more of the kernel can be processed into flour, and the product can be sold as unbleached whole-wheat flour. Two major bread makers, Wonder Bread and Dempster’s, already produce a whole-wheat specialty bread made from white wheat. Two varieties from the program, Snowbird (2000) and Snowstar (2007), are produced on about 160,000 acres each year in Western Canada. Eurostar, Brigade: new durum varieties, new markets?